The variety of different animals that are classified as omnivores can be placed into further sub-categories depending on their feeding behaviors. Frugivores include maned wolves and orangutans; insectivores include swallows and pink fairy armadillos; granivores include large ground finches and mice. ^ a b "Omnivore". National Geographic Education. National Geographic Society. 21 January 2011. Retrieved 4 October 2012. 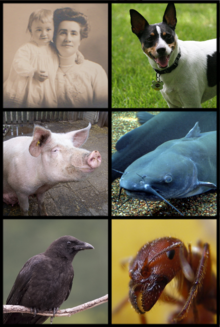 ^ "Animals: Carnivore, Herbivore or Omnivore?". science made simple. 27 February 2014. Retrieved 2 April 2016. ^ "Omnivores' ancestors primarily ate plants, or animals, but not both". 17 April 2012. Retrieved 17 April 2012.